‘Tis the season of sniffles and coughs. Whether the snot-nosed monster is only lurking in the shadows or has already got hold of you and reduced you to a miserable coughing, nose-dripping wretch, the following tips can help protect you against catching a cold or flu, or speed up your recovery time. The white blood cells (aka fighters of bacteria, viruses and all that’s bad) of the volunteers who were given sugar gobbled up significantly fewer bacteria, with the effects lasting a few hours following high sugar consumption. In other words, large amounts of sugar may curb your resistance to infection. So if you’re try to avoid getting ill, or have already been struck down with the a cold or flu, now’s really not the time to be suppressing your immune system by eating high sugar foods. Quality of sleep also matters: people who spent less than 92% of their time in bed asleep were 5.5 times more likely to be sick compared to those who were asleep for at least 98% of their time in bed. It seems that a lack of sleep or sleep disturbances may suppress the immune system making it less resistant to infections. A zinc deficiency can suppress the immune system and cause excessive inflammation. Research shows that supplementing with may decrease the duration and severity of a cold if taken early (within 24 hours of symptoms onset). 4 Before you start popping zinc pills several side effects that can afflict some people. The most common downsides of zinc supplementation are altered taste and nausea. 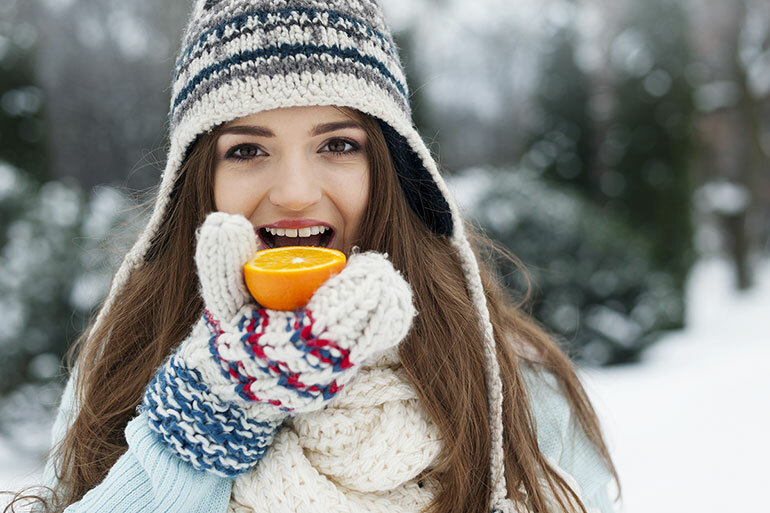 Zinc for colds is popular and you’ll easily find combos of zinc and vitamin C in almost any store. Great sources of dietary zinc: oysters and other seafood, turkey and chicken (the darker meat) as well as wild beef. You can also get a nice dose of zinc in nuts, seeds and legumes. This trace mineral has been found to play a key role in the proper functioning of the immune system. Research shows that selenium plays a role in helping build up white blood cells, boosting the body’s ability to fight illness and infection. Indeed, a selenium deficiency may even be associated with the flu virus to becoming more virulent.6 What’s even more alarming is that a selenium-deficiency may result in the cold virus mutating into a new strain that affects even those with normal selenium stores. Foods rich in selenium: Fish, shellfish, Brazil nuts, wheat germ, garlic and seeds. Vitamin D stimulates your immune system to produce things called defensins and cathelicidins that kill viruses. 7 However, we get the majority of our Vitamin D from sunlight, so there is massive seasonal variation in our Vitamin D levels. Vitamin D levels are highest during summer and lowest in winter. So just when we need it most, our vitamin D stores are low. In fact, many scientists believe the reason we’re susceptible to cold and flu in the first place, is due to the decreasing Vitamin D levels in winter. This spice has been shown to fight rhinoviruses, the most common cold virus. 8 For better results, grate some fresh ginger root and allow it to infuse in a covered cup of green tea for a minute or two. This soothing drink should help provide some relief against coughs, pain and fever. While the research was funded by the largest marketer of kiwifruits, it remains that this fruit is loaded with vitamins C and E, folate, carotenoids, polyphenols and other nutrients that can strengthen your immune system. Plus, kiwi does taste great, so you can’t really lose! Last, but certainly not least. The old wives’ tale may have some scientific merit: researchers found that chicken soup reduced the inflammation that causes several flu symptoms. 8 It appears that veggies, chicken and broth act synergistically to decrease fevers and sore throat. For an even more potent concoction, Dr James Duke, a renowned American botanist, recommends adding lots of garlic, ginger, shallots, basil and sweet bell peppers. Don’t forget to wrap up warm! And remember to up your H2O intake to keep yourself well hydrated. Sanchez, A., et al. (1973) Role of Sugars in Human Neutrophilic Phagocytosis. American Journal of Clinical Nutrition; 261:1180-1184. Bernstein, J., al. (1997) Depression of Lymphocyte Transformation Following Oral Glucose Ingestion. American Journal of Clinical Nutrition; 30:613. Cohen, S., Doyle, W. J., Alper, C. M., Janicki-Deverts, D., & Turner, R. B. (2009). Sleep habits and susceptibility to the common cold. Archives of internal medicine, 169(1), 62. Ferenčík, M., & Ebringer, L. (2003). Modulatory effects of selenium and zinc on the immune system. Folia microbiologica, 48(3), 417-426. Beck, M. A. et al. (2001). Selenium deficiency increases the pathology of an influenza virus infection. The FASEB Journal, 15(8), 1481-1483. Cannell, J. et al (2006). Epidemic influenza and vitamin D. Epidemiology and Infection, 134(06), 1129-1140. James A. Duke The Green Pharmacy Guide to Healing Foods: Proven Natural Remedies to Treat and Prevent More Than 80 Common Health Concerns (Rodale, 2008). Roxas, M. & Jurenka J. (2007) Colds and Influenza: A Review of Diagnosis and Conventional, Botanical, and Nutritional Consideration. Alternative Medicine Review 12(1). Girodon F, Galan P, Monget AL, Boutron-Ruault MC, Brunet-Lecomte P, Preziosi P, Arnaud J, Manuguerra JC, Herchberg S. Impact of trace elements and vitamin supplementation on immunity and infections in institutionalized elderly patients: a randomized controlled trial. Arch Intern Med. 1999;159(7):748-54. Cannell JJ, Vieth R, Umhau JC, Holick MF, Grant WB, Madronich S, Garland CF, Giovannucci E. Epidemic influenza and vitamin D. Epidemiol Infect. 2006;134(6):1129-40. Lustig RH1, Schmidt LA, Brindis CD. Public health: The toxic truth about sugar. Nature. 2012;482(7383):27-9.